ROME - Roman officials were awaiting the results of an autopsy on Wednesday after the unexpected death of Anthony Freeman, an American seminarian from Louisiana and member of the Legionaries of Christ Order, who was found dead in his room earlier this week on Easter Monday. It came as a shock for all as he was only 29 years old and had a bright future ahead of him in the Church. In fact, he was due to be ordained a deacon this forthcoming summer. While authorities are still investigating into his death, it appears to have been triggered by natural causes. Brother Anthony had recently officiated at the Mass given by Pope Francis on Easter Sunday at St. Peter’s. He spent the rest of his day in the company of other seminarians before going to bed. His body was then found lifeless in the afternoon of Easter Monday. He was considered by many to be a true leader of the Catholic faith. He used social network sites to reach out to the younger generations and had even written a book entitled “One step Closer”, inciting young Catholics and millennials to develop their spirituality in this modern day and age. 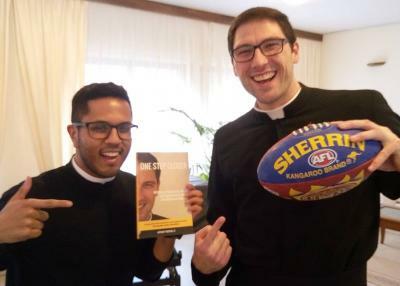 He defined himself as a “Catholic life coach”. As well as advocating religion, he was a sports enthusiast. In some of the photos that appear on his social network sites, he is pictured on the football pitch with a ball in hand. Images on his Facebook page and other sites always portray him smiling alongside other seminarians or in contemplation of God. His profile now reads, “Rest in Peace Brother Anthony. I hope to see you in heaven”.